1. Can't wait for Homeland to start again, very curious to see what they will do this season, given what happened at the end of last season! 2. Interesting conversation with the real Larry from Orange is the New Black. 3. Does anyone else still watch Pretty Little Liars? Well if you (unfortunately) do, check out this new theory. 4. I used to be obsessed with America's Next Top Model. Thanks to BuzzFeed you can relive all the funny and crazy moments. 5. This is a pretty funny satire of what fashion bloggers instagram on a daily basis. 6. 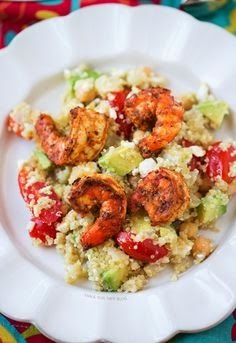 Seafood just fits with summer and this dish looks yummy and easy. Easy being my main requirement!